Just for fun and relaxation after working mostly on writing unit tests and refactoring my PHP remoteStorage implementation, updating the PHP OAuth 2.0 server code, and exploring a proof of concept for some stuff at work, it was time to do something fun. Especially with no-cookie Tuesday coming up! After experimenting with HTML 5 video already years ago in various projects, it was time to write something that is actually usable and ties together all the stuff I’ve been working on so far. 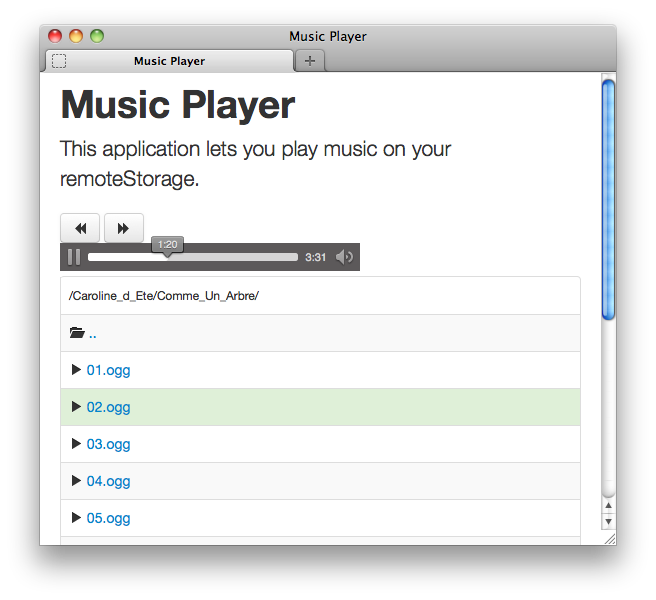 So why not create a music player in HTML, JS and CSS using remoteStorage, the Unhosted approach to developing applications and leveraging OAuth to protect the resources. It was a perfect integration test and obviously uncovered some bugs in the server side remoteStorage code. There is a lot to be improved for sure. For one the ugly audio tag controls should be hidden and something custom, better fitting the rest of the interface should be used. Some other features need to be worked on: only listing files with a content type that the current browser can play, i.e. : show MP3s in Google Chrome, but not in Firefox, show Opus in Firefox, but not Google Chrome, etc. This would probably need modifications to the remoteStorage protocol though. An other great feature would be to have the ability to create and use playlists, that should not be too hard though with the current architecture. This entry was posted in Uncategorized on January 10, 2013 by François.